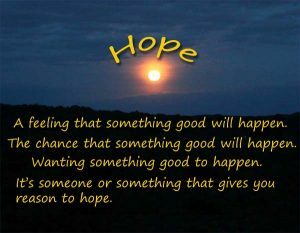 It’s someone or something that may be able to provide help … someone or something that gives you a reason for hoping. This is our humble attempt to identify a few of the symbols and words of hope. Wednesday, July 13, was a very difficult day for Kitch and me. We traveled to CMC in Scranton for my cardiac catheterization. The results of the test were not good. The cardiologist discovered two blocked arteries in my heart. To make matters worse, in order to fix them, they would have to go through the original graphs from my open heart surgery. The cardiologist told us it was too dangerous to do that. He would try to treat the blockages with medications. After eight hours in the hospital, we made our way home. 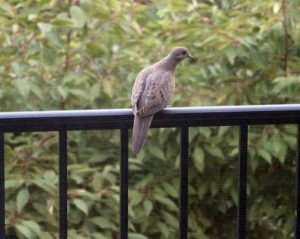 Shortly after we arrived, I noticed a beautiful peace dove perched on the railing outside the room where I work. The peace dove is universally recognized as a symbol of hope. The peace dove represents life, hope, renewal and peace. The peace dove reminds us there can be no peace without hope. The Monarch butterfly is called the "Symbol of Hope.” It also represents change, endurance and life. On Saturday, July 16, Kitch and I saw the first Monarch butterfly of the season. 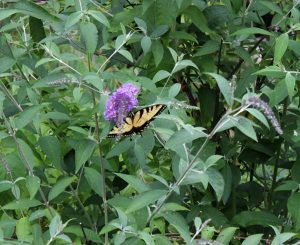 Ironically, it was fluttering around a recently planted butterfly bush in the Garden of Life. I was mesmerized by this scene. There can be no luck, happiness and success without hope. During the difficult moments of change, inconvenience and failure, hope provides a pathway to success. On a beautiful August afternoon Kitch and I received a telephone call from our neighbor Marge Janosik. Her granddaughter was visiting and she wanted to come to the garden to feed the fish. What a pleasant surprise. We obliged, and Rachel’s visit turned out to be one the most memorable moments in the garden. Rachel is full of life. She has a very pleasant disposition, and she is a good conversationalist. She fed the fish in the Angel Garden, and then she walked along the path to the Garden of Life. Her grandmother joined us, and we took some pictures. 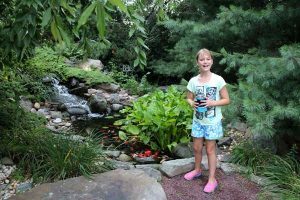 Little did I realize when I snapped this shot of Rachel, the fish in the pond are symbols of hope in the Christian tradition. While walking in the garden in October, I saw the proverbial last rose of summer. 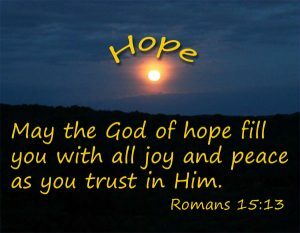 You may be asking yourself how this applies to the symbolism for hope. 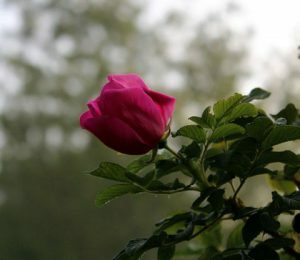 According to Avia Venefica, in Tarot, the rose is considered a symbol of balance. The beauty of this flower expresses promise, hope, and new beginnings. It is contrasted by thorns symbolizing defense, loss, and thoughtlessness. 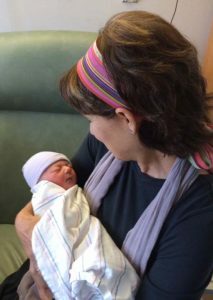 A new baby is like the beginning of all things wonder, hope a dream of possibilities. Children are the bridge to heaven, because they give us hope and happiness. Some things leave a lasting impression on your mind and in your heart. They become the fibrous tissue that gets you through the most difficult experiences in life. 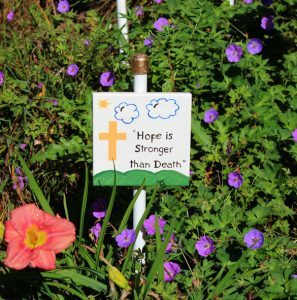 Hope is stronger than death. These words came straight from a child’s heart. They were designed to ease the pain of everyone who visited the temporary memorial to the heroes of Flight 93. During the years that followed this discovery, this profound aphorism encouraged us during medical emergencies like cancer and heart disease, failures, disappointments and many other bumps on the road of life. 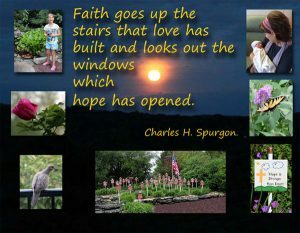 This saying gives testimony to healing power of hope. On Tuesday, November 8, Kitch and I stood in a long line at our polling place the Fellowship Church. For almost two years, Americans had been waiting for this day. Although we had to wait in line for more than an hour, it was a very pleasant experience. We had conversations with neighbors, friends and former students. Let us all walk forward into the uncharted waters of the future with hope, love, respect and an understanding that we belong to each other. God bless you for taking the time to read this article, and God bless America.